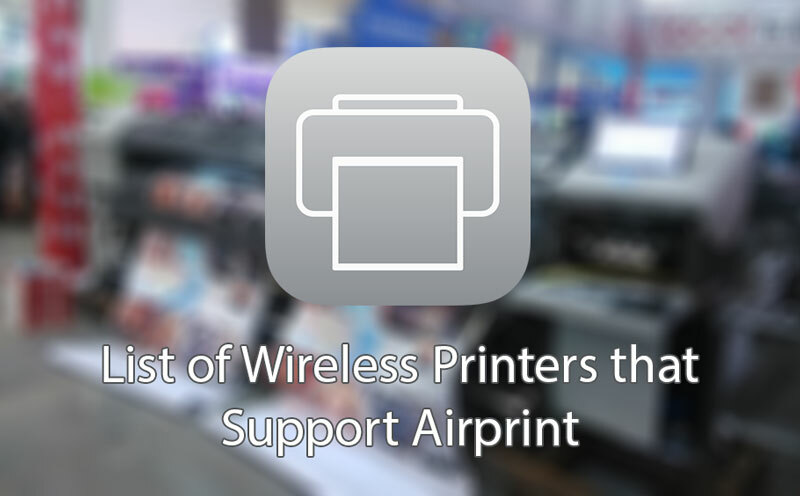 List Of Wireless Printers That Support Airprint | GUI Tricks - In Touch With Tomorrow! List Of Wireless Printers That Support Airprint - GUI Tricks - In Touch With Tomorrow! Canon PIXMA iP110 is perhaps the best printer that offers the best value for the price you invest. it is small, light, cute, portable. It can easily be placed in a laptop backpack. Moreover, the presence of Wi-Fi allows you to print numerous documents through the air using the phone. It also comes with a free native program for printing from a cell phone. But, this printer is available only in black colour. You can’t draw sketches on top of the printout. Sometimes, the connection (wi-fi or USB) doesn't work properly. The HP LaserJet Pro M104w comes with a Wi-Fi Direct transmitter. It allows you to connect it to a wireless network and perform direct synchronization with smartphones and other mobile devices. It is a suitable for home as well as office use if you have to print up to 10,000 pages per month. It can adjust to any task without delay due to the performance of up to 22 sheets per minute. It takes the minimum time to make the first print. This printer can automatically shut down when it's not used for a long time. So, it helps you to reduce the power consumption up to a great extent. The laser printer Xerox Phaser 3020 is your true pal if you look for an indispensable assistant for monochrome printing in large volumes. It is a perfect printer for both office and home use. Its low noise level doesn't distract your attention. This printer model is designed only for printing black or blue paint. So, it comes with two cartridges already. Xerox Phaser 3020 will withstand the most extreme loads during work as it can easily print up to 15,000 pages per month, or 500 pieces per day. It has a large tray designed for about 150 sheets. It has a built-in Wi-Fi module. So, you can configure a wireless network and connect the printer to several computers. Laser printer HP LaserJet Pro M402dn is the suitable printer for home and office use as it prints around 38 pages per minute. It can print up to 80 thousand sheets per month. This printer is equipped with a standard Ethernet connector, which allows you to connect the printer to a local network. It supports almost all modern printing technologies HP ePrint, Apple AirPrint and Google Cloud Print. Its built-in screen allows you to perform quick print setup even when the device is used autonomously. The automatic two-sided printing feature allows the printer to perform complex tasks easily and quickly. Laser printer HP LaserJet Pro M402n can be used as a network device because it comes with a standard Ethernet connector and supports modern printing technologies from mobile devices, including Mopria, HP ePrint, Apple AirPrint and Google Cloud Print. It can print maximum 38 pages per minute and its compact display allows you to quickly set up optimal settings. Its 250-sheet tray allows the user to access the priority print compartment with a capacity of 100 pages. It helps them to print complex documents easily and quickly. Brother Laser Printer HL-L2340DWR is famous for economical material consumption and reduced operating costs due to separately purchased toner cartridges of increased capacity. It prints professional-grade documents with HQ1200 resolution (2400x600 dpi) that offers high detail and clarity of text. It supports Brother iPrint & Scan, Google Cloud Print 6, Apple Air Print, Wi-Fi Direct, Cortado and Mopria. HP LaserJet Ultra M106w is a high-performance printer designed for black and white laser printing. This is an office model printer that provides fast and high-quality printing of documents. This printer is capable of printing up to 22 pages per minute. The first page will be ready in 7.3 seconds when you send the file to print. So, you do not have to wait long for the documents to get ready. Using branded black toner cartridges is a guarantee of high contrast and intelligibility of texts, drawings, photographs. The printed texts and images are not smeared. So, they do not fade for a long time. The printer supports Wi-Fi Direct, which allow you can send documents to print from smartphones, tablets, laptops, even if you cannot connect to the local wireless network. Samsung Xpress M2026W is affordable and popular option among wireless printers. It comes with Wi-Fi, NFC technology, Wi-Fi Direct, and mobile printing that offers high-speed printing. The device allows you to print on such non-standard media as envelopes, cards, matte paper, labels, glossy paper, film. The maximum size of printed paper is A4. The speed of printing a document is 20 ppm. You can print up to 10,000 pages per month. But, it lacks the two-sided printing function and the continuous ink supply module is not supported. Apart from this, the pigment ink is not used in which the dye is placed on the surface of the carrier and not absorbed into its construction. These are top 8 wireless printers that support Airprint. Choose them as per your needs and budget. David Blakey is a blogger by profession with 5 years of experience. He is associated with Hot Toner, colour toner Specialists in Australia, selling all samsung and brother and HP Photosmart 5520 ink cartridges & printers online in Australia. He is an admirer of sharing his innovative ideas with others on the technology trends and Gadgets.